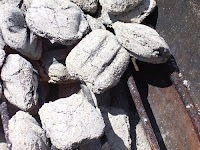 One of the quickest ways to fix that funky fuel taste in backyard barbecue is to ditch the charcoal lighter fluid. Cooks are too often overzealous with the fuel (hey, we’re guys) and it imparts a bit of an aftertaste if you’re not careful. If you DO use lighter fluid make SURE it’s all burned off well before cooking. Better yet… try a Charcoal Chimney Starter. Chimney starters looks like a jet engine with a handle on the side. 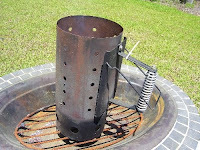 They cost about $20 and they’re really easy, safe, and environmentally friendly way too start charcoal. Find a clean, clear non flammable area to place the Chimney Starter. You could use the grill but you’ll still need a non flammable place to set the RED hot chimney once you’ve filled the grill. A little caution goes a long way. Use gloves. Fill the larger compartment in the Chimney (the top) with regular or hardwood lump charcoal (recommended!). Match Light or instant lighting (fuel soaked) is not needed. Compress two large sheets of newspaper loosely into the bottom chamber. The whole key is getting air to everything so don’t pack it in to much. Set the starter upright on the lower grate on your grill (remove the top one) and ignite the newspaper through the bottom holes using a lighter or match. That’s it. 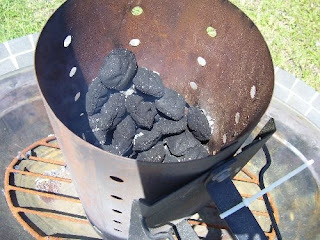 After about 20 minutes your charcoal should be ready. Wait until the coals on top show some white ash. Carefully pour and arrange your coals on the grate. Yes Gloves… and be careful where you place that chimney it’ll be blistering hot for about 30 minutes. Creating the perfect sauce for barbecue often involves some sort of syrupy sweet ingredient that can make of break the secret flavor. I just saw Pat Neely of the world famous Neely’s BBQ on TV and he had a great trick for measuring heavy syrups and thick liquids like honey or molasses (two common sauce staples). The next time your measuring corn syrup, honey, or even maple syrup just give the measuring cup a good spray of PAM or a similar non stick oil spray. Not only will it keep your measurements consistent… there’s less waste and it makes post sauce clean-up a bit less sticky! That name may be a bit confusing… beef Brisket has always been a Texas thing. Mesquite, slow slow smoked, a tradition down there. Here’s a Barbecue Tricks version of the brisket that tastes great with HICKORY smoke and a bit of sweet heat to give it a southern twist. We used a Brinkmann Gourmet Electric smoker that keeps the smoker a low 225 degrees and also used a combination of chunk and chipped hickory for smoke. Brisket is an all day affair… so using a true smoker (with a good drip pan) will really save you some peace of mind. Electric smokers are offensive to purists (no charcoal?!) but if you keep it smoking with pre-soaked wood chips (in a foil pouch) you can’t tell the difference. Start the night/day before by separating the FLAT portion of the brisket from the tip. Trim away most of the excess fat (down to about 1/4 of an inch covering the flat). This will cut the cooking time way down and give you more smokey surface area. Continue by rinsing clean and rubbing a 5 to 10 pound brisket with a simple RUB. Wrap with plastic wrap and refrigerate until morning. It should “cure” 4-12 hours for best results. Give yourself extra time for the smoker and restrain yourself from lifting the dome lid more than you absolutely have to. Lifting the dome lid will add at least a half hour to the entire process every time you release the already low heat. Hopefully the smoker has a side door to replenish chips and drip pan liquid. Remove your meat, unwrap and allow to slowly come to room temperature (about an hour). Start your smoker and give it 40 minutes to heat up. Place the meat – fat side up – over the drip pan to avoid messy drips. After smoking 5 or 6 hours we enlisted our Barbecue Trick: sprinkle the brisket liberally with brown sugar and paprika. Place it upside down (fat side down) on aluminum foil and coat the other side. Check the internal temperature. Wrap tightly with foil and put back on the smoker. The entire smoking process will vary but our Flat cut was finished (internal thermometer to 190 degrees ) in about eleven hours (opening the lid only once). The Point cut took an additional 2 hours to get to internal 190 degrees (the lid was often opened for testing). One you remove from the smoker you STILL will want to wait another 40 minutes to allow the meat to rest and retain coveted juices. Remember YOU NEED TO ALLOW A LOT OF TIME for this entire process. Back time from meal time and make sure to include an hour for “heating up the smoker” and getting the chill off the meat. Plus another hour for the final “rest”. It’s an all day affair. Our tested brisket started as a 10.5 lbs piece of meat but when the flay was separated it was two approximately 5 lbs. pieces. Flat took eleven hours on the smoker. The point was thicker and a bit bigger and took thirteen. If you’re looking for a quick and easy all purpose rub this is it. It’s simple… and once you make it you’ll want to keep it on hand to sprinkle on everything from chicken to ribs. I even like the sweet heat on popcorn! 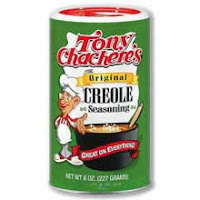 It qualifies as a trick because of the super simple secret ingredient: Tony Chachere’s seasoning available in most grocery stores. Mix thoughouly with fork and store any remaining rub in and airtight container or jar for up to one month.